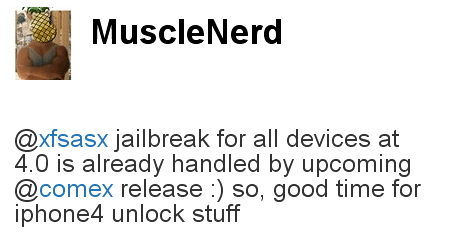 MuscleNerd, famous hacker from DevTeam, has announced via Twitter that an upcoming comex release will jailbreak all 4.0 devices. This will include latest iPhone 3GS, iPhone 4, new iPod Touch and iPad. Comex is also well-known, he authored the 3.1.2 and 3.1.3 jailbreak called Spirit. He's also recently demonstrated Frash, an upcoming release of Flash for the iPhone and iPad.